Robert Noonan used a hearing assist device April 8 at Mass at St. Patrick Church in Wentzville. In December, the parish installed a system that includes a radio transmitter to broadcast the church’s sound system to people who need assistance hearing. Tom Larouere was used to Mass being a mumble of words. But thanks to a new hearing assistance system, listening to the Word of God now is much clearer. In December, St. Patrick Parish in Wentzville installed a system that includes a transmitter that broadcasts the church’s sound system. Users wear a small receiver on a lanyard, which can either be plugged directly into telecoil (t-coil) hearing aids or used with a small earpiece. The system with six receivers cost about $3,000, which was funded by a Christmas and Easter car magnet fundraiser coordinated by the Knights of Columbus Council #10154 at St. Patrick. Father Brian Fischer, parish pastor, noticed that most of the receivers — nine in total including three older devices the parish already had — are being used at Masses. Signs posted on the front doors at church let visitors know the hearing assistance system is available. The devices also can be used with the sound system in the church social hall. The example highlights the importance of churches accommodating the needs of parishioners with hearing loss. Roughly 15 percent of adults ages 18 and older experience hearing loss, according to data from the Centers for Disease Control and Prevention. That percentage increases as a person ages. Larouere has experienced hearing loss since childhood, and was fitted with hearing aids at the age of 18. Over the years, finding the right balance while listening in church had proven difficult. Turning up the volume on his hearing aids also meant turning up the background noise. He also noted that the public’s understanding of hearing loss — including the use of hearing aids and hearing assistance systems — has changed over the decades. When he was younger, he didn’t want anyone to know that he had hearing loss. He taught himself how to lip read and generally did his best to conceal that he wore hearing aids. When his granddaughter was fitted with hearing aids, she took a different approach, opting for a bright pink set. 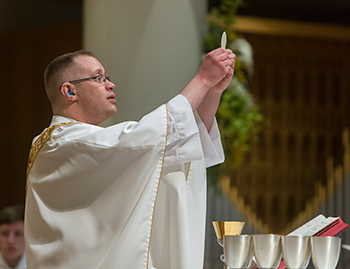 Father Dan Kavanagh, associate pastor at St. Patrick Parish in Wentzville, has used a hearing aid on and off since first grade. Father Kavanagh said it’s tough to know how many people in the parish need the upgraded hearing assistance system, but that there is definitely a need. Father Kavanagh said it’s tough to know how many people in the parish have significant hearing loss, but he knows there’s a need. For Larouere, the hearing improvement at Mass has made for a happy heart. “Now it’s just me and the Lord,” he said with a smile. • About 2 to 3 out of every 1,000 children in the United States are born with a detectable level of hearing loss in one or both ears. • Approximately 15 percent of American adults (37.5 million) aged 18 and over report some trouble hearing. • Among adults aged 20-69, the overall annual prevalence of hearing loss dropped slightly from 16 percent (28.0 million) in the 1999-2004 period to 14 percent (27.7 million) in the 2011-12 period. • Age is the strongest predictor of hearing loss among adults aged 20-69, with the greatest amount of hearing loss in the 60-69 age group. • One in eight people in the United States (13 percent, or 30 million) aged 12 years or older has hearing loss in both ears, based on standard hearing examinations. • About 28.8 million U.S. adults could benefit from using hearing aids.